Electric vehicles and charging stations are growing in numbers and support. What is missing, however, is an Australian standard or even a recommendation. More electric vehicles (EVs) are hitting Australia’s roads, and more public charging stations are being installed to support them. What is missing, however, is an Australian standard or even a recommendation for charging connectors – the plug that joins the car to the charging station. When we started Australia’s first electric vehicle trial in Western Australia in 2010, there were no manufacturer-built cars available and we had to use locally built conversions. As of today, Mitsubishi, Nissan, Holden and Tesla offer electric cars in the Australian market. Nearly all international car manufacturers will follow in 2014 and 2015. Charging networks have been established as well. In Perth we have a public charging network of around 30 stations (7kW AC). There is a similar sized network in Melbourne, but less in other capital cities. The two most prominent charging station types for AC charging are IEC 62196 Type 1 (aka SAE J1772, used in the US and Japan) and IEC 62196 Type 2 (aka Mennekes, used in Europe). The internal architecture of these station types is largely identical, but Type 1 stations are restricted to single-phase power, while Type 2 stations can provide single-phase or three-phase power, which means at least three times faster charging. Therefore, Australia’s choice should obviously be Type 2, even more so since three-phase connections improve the grid balance. The reason behind the two competing world standards is the difference in electric power transmission grid. Australia, like Europe, has a three-phase power grid, while the US and Japan only have a split-phase single phase grid. Imagine the confusion if there was no standard for petrol car fuel nozzles! 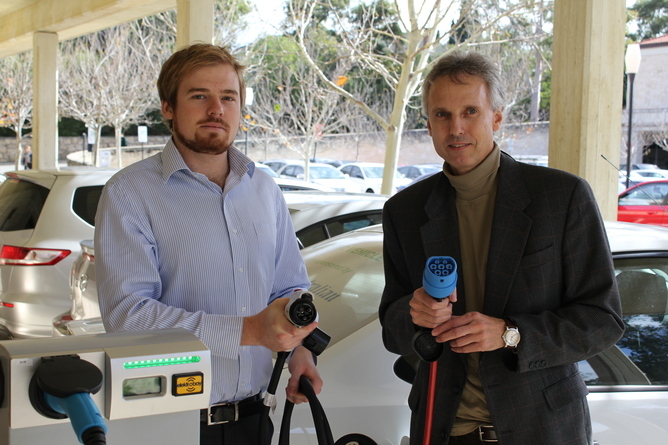 The equivalent is now happening for electric cars: Because Australia has not yet adopted an EV charging connector standard, a mix of stations is currently being installed. Although we are still dealing with a very low number of charging stations overall, they do set a precedent. Whatever happens now will determine Australia’s EV charging future. The availability of stations will influence car manufacturers when deciding which EV type to export to Australia. Getting two different types of cars is not helpful for the early adopters of electric vehicles, nor for the operators of charging networks. Remember Beta versus VHS video? Eventually one standard will prevail and non-compliant stations and cars will have to be converted at a significant cost. Or worse, both standards will remain side-by-side, similar to the situation we have with screw-type and bayonet-type light bulbs in Australia. If we wait, will things get simpler? Maybe the already available next generation of fast-DC chargers will solve this dilemma? Unfortunately not. Australia’s first fast-DC charging stations follow the Japanese ChaDeMo standard, which most likely will be obsolete in a couple of years. That’s because the world’s eight leading automotive manufacturers from the US and Europe have instead agreed to support the new Combo DC-charging standard. Although a common US/European standard sounds great, there are again two different connectors in order to be compatible with slow AC charging: “Combo Type 1” for the US and “Combo Type 2” for Europe. Maybe inductive charging will finally eliminate the choice by eliminating connectors altogether? We’ll see at the end of the decade. Graph of the Day: How green is your electricity? Type 2, like PAL is the obvious choice. Apparently Nissan (Leaf) do not support charging from a standard 10A power point, they insist on a dedicated 15A power point. It makes more sense to me if they did support standard 10A power points, then top up and overnight charging can be accomplished virtually anywhere. I can understand that the Leaf is a Japanese car mainly aimed at Japanese and North American markets, but I’m not sure why they haven’t produced a European varient that accepts standard European current. Is it because they think they won’t be able to compete with European electric cars and so they haven’t bothered, or is there another reason? Part of this is the battery size. The leaf has a 24kwh battery, so a full charge would take at least 10 hours from a 10 amp outlet. of course, a full charge is rarely needed. There is nothing wrong with charging at a lower current, but I suspect Nissan did this to avoid the perception that the car takes a lot of energy and is slow to charge. However, it does limit the capability to take opportunistic charges. Also, the charge should be able to be completed within the night low off-peak time window. An EV, such as the Tesla, may have a battery as large as 80kwh, in which case, a 10 amp outlet would take a day and a half, so a more powerful charger is needed. The Leaf does accept Japanese/US current from their standard power points and this is pretty slow, so it’s not a desire to appear fast to charge that has prevented them from making a version that accepts European current. The owner of an EV with a Tesla sized battery that accepted standard European/Australian current would only need a fast charger at home for an overnight charge if they regularly drove about 120 kilometers or more a day. The average Australian car is driven about 40 kilometers a day. But do we really not believe in the wonders of de-regulation, freedom of choice, free market competition and all that other holey of holey, quasi religious nonsense, so near and dear to our new PM? Trouble is that Standards are as nebulous as research, costing money that Tony must have for his budget surplus, eventually. Seriously though, Type 2, pretty please. Today’s EVs usually have a fine collection of adapters for the various ‘standards’, including a 20A 3-phase plug. A standard would be good, but it won’t completely eliminate the need for power plug adapters where no standard EV charger is available. This flexibility something that manufacturers should consider properly, otherwise their EVs may become stranded with the associated bad press.